Derivative Content : Let's Get Dangero-Wait...What? Pop Quiz: if you were going to make a game based on Disney super-duck, who would you choose? Darkwing Duck? Gizmoduck? Those ducks from the cartoon adaptation of The Mighty Ducks? No, you’d choose PK. You know PK, right? Donald Duck’s superhero alter ego? Oh wait, no. Maybe you know him by is original Italian name: Paperinik. You know? He’s got comics going back to 1969? Still nothing? I think he was called The Duck Avenger too in America? Or was it Superduck? Phantom Duck? For the purpose of this review he’s called PK and he’s got a game called PK: Out of the Shadows. Anyway, the game recaps PK’s well-known superhoro origin story. Donald Duck is a security guard until he has a creepy CGI dream and wishes to become a superhero. A floating green duck head computer named One kidnaps him and grants his wish. 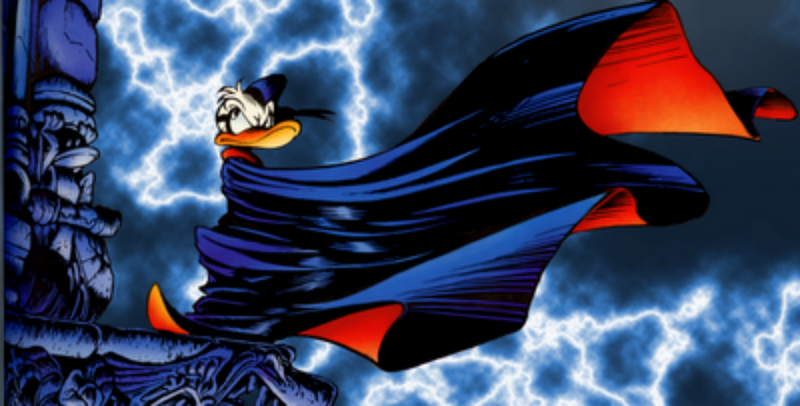 Then evil duck aliens called Evronians attack Earth and Donald (now called PK) has to stop them. It’s a story as old as time itself. PK: Out of the Shadows is a platformer that reminds me of the first Ratchet & Clank game...but...not nearly as good. PK has an arm mounted gun (which looks a lot like a Yu-Gi-Oh Duel Disk) that you use to kill alien fowl as you jump from place to place. As you go along you pick up items, free scientists, and get power-ups and new abilities. Pretty standard stuff. But like I said before, it’s just not really good. The platforming is the same basic stuff you’ve played before, but levels can be oddly dark and confusing to navigate. The combat isn’t really hard, but the lock-on can be finicky and the combat never really changes in any way. The power-ups range from expected (like a glide, a move that lets you destroy breakable objects, a remote-controled robot that can fit in small places) to downright pathetic (like a laser that kills enemies in 4 shots instead of 5, a charge shot that is useless in 99% of situations). I don’t really know what to think of PK: Out of the Shadows. The game isn’t really terrible, it’s just annoying. And whatever isn’t annoying is just plain and boring. The final package is a bad game like a lot of licensed games, but I don’t think PK really has enough brand recognition to sell well. I mean, not even Donald’s voice actor could stick around after the first FMV. (PK is an entirely different voice than Donald) It’s a bad game, but it’s a bad game with no audience. Derivative Content is a series of reviews for licensed games. Next time I’ll talk about a game that has in incredible amounts of destruction.